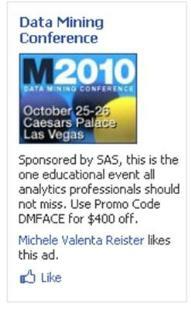 For the first time this year, our M2010 Data Mining Conference marketing team decided to give Facebook advertising a try. I ran a split test, to test the criteria used to identify the reach (keywords versus SAS connections). At the end of the week, my ads had received 517 clicks at an average of $0.77 p/click. (My budget was limited to $50 per day, for 8 days). I am able to attribute the ads to two conference registrations totaling $2,198 in revenue for an ROI of 451%! 1. An ad linking to a landing page performs better than an ad linking to a Facebook event page. As I mentioned, in my first attempt, I ran two ads. The idea was to test the performance of an ad linking to a landing page versus linking to a Facebook page. In all the research I had done prior to launching my campaign, the consistent advice was to keep your customers on Facebook. However, this wasn't the case for me. The ad which received the two clicks linked to our landing page. Lesson learned: don't take advice at face value. Try it yourself to know what works best for your company, your ad, your product and your customers. 2. Split testing your ads doesn't exactly provide scientific results. There is one caveat to Lesson Learned #1. I created one campaign, under which I ran the two ads to see which performed better. The thing is, once one ad starts outperforming the other, Facebook automatically "favors" it and gives it more impressions. This is a good thing on one hand, because Facebook is helping you achieve better results. But, on the other hand, if my ads are not receiving comparable impressions, how can I come to any solid conclusions about the results? Lesson learned: If you want to more accurately split test your ads, create each ad under a unique campaign. 3. Don't walk away once you've placed your ad. Facebook advertising is slightly different than other online advertising I've done in the past. When you bid per click (or per impression, but I recommend per click) you are competing against all the other people who want to advertise to the same demographic as you. Being that Facebook advertising is dynamic and new ad campaigns are starting and ending every minute, the suggested bid range is constantly changing. If you want your ad to perform well, you need to bid on the high end of the suggested range. The high end might be $0.95 in the morning and $3.00 by the evening. Lesson learned: monitor your ads constantly and make adjustments as needed. 4. If you really want to know how successful your Facebook ad campaign is, don't rely on Facebook metrics alone. In the ad copy (and on the landing page) I referenced a unique Promo Code offering $400 off the conference fees. 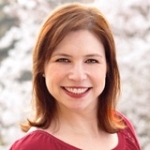 This allowed me to pinpoint sales resulting from the ads, from which I could calculate my ROI. I hope your Facebook ads bring you a fantastic ROI like mine, or that your mistakes don't cost you more than two bucks. If you have any other Facebook advertising tips to share, please leave me a comment.